We absolutely loved Disneyland Paris’ Disneyland Park. The design is beautiful and the rides will get your heart racing. Tom Bricker of the Disney Tourist Blog recommends enjoying Disneyland Paris (DLP) like a fine wine. We couldn’t agree more. Wander, get lost, sit and enjoy the ambiance of this truly special place. The entire complex is referred to as Disneyland Paris (or DLP). Two theme parks live inside DLP: Disneyland Park and Walt Disney Studios Park. This blog article will discuss our review of Disneyland Park. If Characters are your thing - make reservations when necessary and schedule your day around the characters. Download the Lineberty App before you leave home. Use our free Family Travel Plan as a guide for planning your perfect DLP day. Yes, the castles at every Disney Park are stunning. But there’s just something about Le Chateau de la Belle au Bois Dormant at Disneyland Park that calls to us. Maybe it’s the color? We are suckers for pink here at Two Scoops. Standing twice as tall as its California counterpart, Le Chateau de la Belle au Bois Dormant provides many opportunities for the perfect Instagram pic. Maybe it’s the invitation to explore as a guest in Aurora’s castle. Climb the stairs to marvel at the intricately designed castle structure. Circle the stairs and enjoy La Galerie de la Belle au Bois Dormant, a gallery of stained glass art illustrating the story of Princess Aurora. FUN FACT: The 9 stained glass windows were made by hand in London by a team of artisans overseen by Peter Chapman, who worked on the restoration of the Notre Dame de Paris. Maybe it’s the dragon. Yes folks - there’s a dragon and it’s super cool. This imprisoned beast, stretching 89 feet (27 meters) head to tail, is chained in La Taniere du Dragon (a/k/a the dungeon) and occasionally growls about its current condition. Find one of the dungeon entrances (one outside and one inside) and go visit this infamous castle resident. Overall, you will find the rides more intense than their Florida counterparts. (We’ve yet to compare them to their California cousins - so we’ll update after that trip!) They seem faster and definitely get the riders closer to the action. Adrenaline seekers simply must ride Hyperspace Mountain and Big Thunder Mountain. The rest of the rides evoke one’s childhood Disney memories. While they may not be a grab-your-hat kind of ride, they are fun nonetheless if you’re embracing the Disney experience. DLP makes that easy by the fabulous theming incorporated into each and every ride in Disneyland Park. Take Adventure Isle for example. Wander around this charming area that masterfully blends the stories of Peter Pan and Captain Hook, Jack Sparrow, Swiss Family Robinson and Pinocchio. If meeting characters is your thing, then you might need to put a little extra effort into planning. I’m reminded of the french phrase c’est la vie. Roughly translated, it means “that’s life”. It will do you well to repeat that as your mantra when trying to arrange your meet ‘n’ greets. We snagged our one (and only) character pic in the lobby of our hotel, Newport Bay Club. A new character (mostly the Fab 5 during our stay) appeared every day in the little fireplace room off the main hall. Good way to get the pic without wasting valuable park time. We feel impelled to take just a brief moment and share a disappointing truth. It’s more of a two-edged sword. If your favorite part of visiting Disney is shopping, pin collecting or buying souvenirs, perhaps you should find another hobby for this trip. If you are familiar with the Disney gospel ‘at the end of every ride shall be a gift shop’ , please know that Disneyland Paris has not yet adopted this crede. Shops are concentrated on Main Street and are limited compared to Walt Disney World’s Magic Kingdom. There is a World of Disney store in Disney Village, which might ease the shopping withdrawals. However, if what you hate about other Disney parks is that ‘at the end of every ride shall be a gift shop’, do we have some good news for you!! 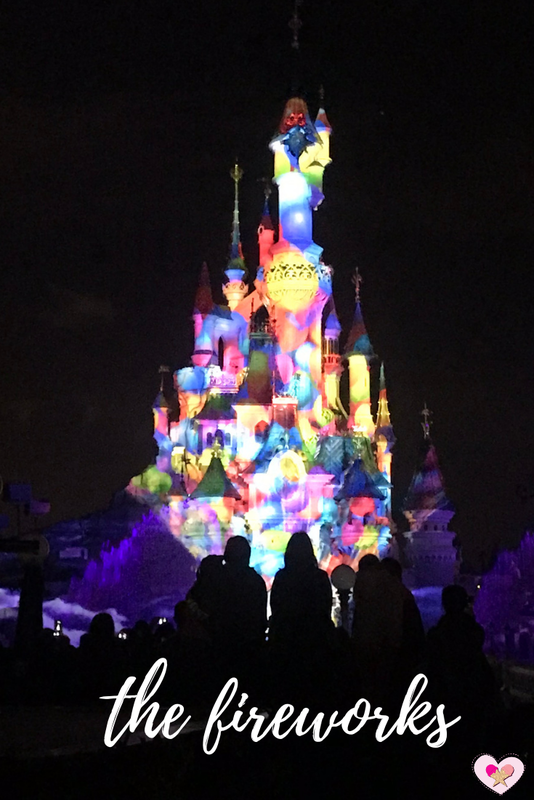 You will love Disneyland Paris and enjoy the ability to immerse yourself into the story without getting stuck in a gift shop. Sleeping Beauty’s Castle comes to life right before your eyes and leads guests through a journey of classic Disney tales. Lasers, dancing water, flames and fireworks light up the night sky. Similar to the production in Florida, we enjoyed hearing some of our favorite tunes in French. Here’s a great YouTube video by The DIS if you can’t wait! In a refreshing turn of events, you don’t have to stake out your perch hours before the show. We were able to score a fantastic spot just 30 minutes before the show began. Since our fireworks tradition requires popcorn, we left a few to hold the real estate while others searched for popcorn and snacks. Disneyland Paris is a beautifully French version of our beloved American classic. Take it slow and don’t compare it to its sister parks around the world. Simply enjoy the peaceful ambiance of this truly charming park. Ready to plan your family vacation to Paris?